Once you create your own account, you can create a bookmark on your personal web browser so you do not need to go through here if not needed. If you have any questions about PowerSchool please contact the school office for assistance at 773-589-1000. 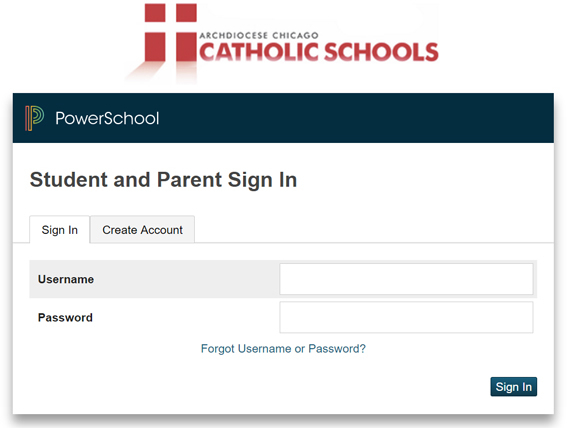 If you are already a PowerSchool user you can type in your User Name and Password. You will create your own PowerSchool login and link your child(ren) to that account. All fields are required. Enter your first name, last name, email address, desired user name and password (twice for verification). Choose your relationship to the student from the drop down menu. You many enter your other children’s codes on this same screen, or add them later under Account Preferences. You will see your child’s attendance and grades for the active term. The areas we are focusing on with our Parent Portal are Grades and Attendance, Attendance History, and Account Preferences.